In dubbing this film 'Dances with Samurai', Tom Cruise's latest attempt to score himself an Oscar at last, I feel the critics have sold The Last Samurai short. Instead of the self-indulgent, testosterone fuelled, one man show I was expecting, I found myself gripped by a moving, intelligent and deeply heartfelt film. Tom Cruise gives a very fine performance as Captain Nathan Algren, a disillusioned US army veteran who, fresh from slaughtering savages in post Civil War America, finds himself employed by the manipulative advisers to the Emperor of Japan to suppress a rebellion by the Samurai, the elite Japanese warriors who now find themselves opposed to the increasing Westernisation of their nation. Algren claims he'll kill anybody for $500 a month, yet is haunted by visions of the cruelties practised on the Native Americans by himself and his comrades, and is reduced to drowning his miseries at the bottom of a whisky bottle. Forced to lead his bumbling, untrained Japanese troops into battle against the Samurai, lead by the daunting rebel Katsumoto, Algren is defeated and taken prisoner. Taken to Katsumoto's remote village home in the mountains, where he must remain until the snows melt, he gradually learns to appreciate the value of the customs and beliefs of his captors, their innate nobility and discipline, their adherence to a strict and moral code of honour. And so begins his gradual conversion to the Way of the Samurai. The initial clash of cultures evokes a fair amount of gentle humour, which I hadn't been expecting, as Algren struggles to learn Japanese, fight like a Samurai and, er, wear a dress. And of course there is also the burgeoning romance between Algren and Katsumoto's sister-in-law, Taka, whose husband Algren himself killed in battle. Fortunately, like an elegant Japanese dance, the romance is all in the longing glance, the tentative touch, the significant gesture and gentle word: for it to have proceeded further, Hollywood style, would have seemed really wrong. 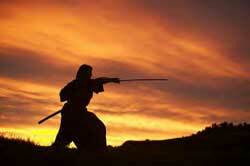 Like Algren, we too quickly come to admire the mighty Samurai, who engage the imagination instantly. Of course, they were always going to be way cooler than the imperial forces (they wear armour and fight with swords and bows and arrows so they must be), but all the same, the scene in which they emerge from the misty forest on horseback to face the rifles of Algren's army, clad in ornate armour complete with magnificent horned helmets, is utterly breathtaking, and could have come straight from The Lord of the Rings. In fact a lot of The Last Samurai reminded me of Peter Jackson's trilogy - and not just because the film was also shot in New Zealand. 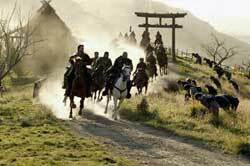 Like The Two Towers and The Return of the King, the battle scenes are incredible, featuring quite a bit of bloodthirsty sword on sword action and some awesome cavalry charges - which of course are now old hat to the stunt horses of New Zealand, who must be forming lines, charging and rolling over dead in their sleep by now. Come to think of it, Katsumoto's beautiful grey horse did look suspiciously like Shadowfax. 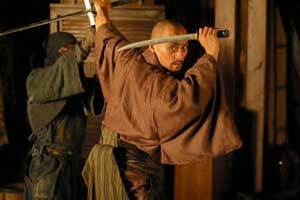 Whilst Tom Cruise throws himself heart and soul into his role, and was clearly deeply affected by the experience, credit must also go to his co-star Ken Watanabe, who gives the film spiritual depth and gravity as rebel leader Katsumoto. Calm, dignified and powerful, he brings to the part the same sense of regal nobility that Yul Brynner and Chow Yun Fat bring to the role of the King of Siam in The King and I and Anna and the King. Billy Connolly, in the role of Irish Sergeant Zebulon Gant, adheres to the Sean Connery school of playing an Irishman: keep your Scottish accent but say things like 'to be sure' a lot and hope the Americans don't notice. It's rather nice to see Timothy Spall playing a posh bloke for a change: translator, photographer and all-round Japanese expert Simon Graham, another character we warm to as he undergoes a significant change of values due to the influence of the Samurai. The scenery is breathtaking and the recreation of Katsumoto's home town is picture perfect, complete with achingly lovely pink Japanese blossom trees. Hans Zimmer's score provides an evocative sonic backdrop, whilst the pace of the film, in which moments of calm dignity are punctuated by frenetic action (and some fantastic martial arts sequences, incidentally), befits the Samurai's twin goals of contemplation and warfare. One suspects that the true story behind the demise of the Samurai was not so black and white, but if there has been a Hollywood gloss applied to the story, it would appear to have been done for worthy reasons. 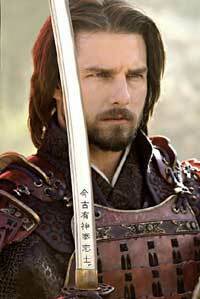 The Last Samurai is an enormously moving, thought provoking film that engages the audience from start to finish. A fantastic achievement - let's hope it garners Tom Cruise the Oscar he so deserves.